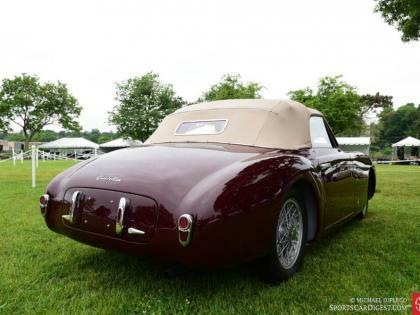 2016 Greenwich Concours — Automotive Restorations, Inc.
Greenwich 2016 – Its Founder’s Legacy very much intact! Bruce Wennerstrom and the whole Wennerstrom family have worked hard to create this benchmark for the start of the collector car season in the Northeast. Sadly, 2015 was Bruce’s last year, but we are delighted to say that the Family and most particularly Mary Wennerstrom have worked hard to continue this well-built tradition beautifully. 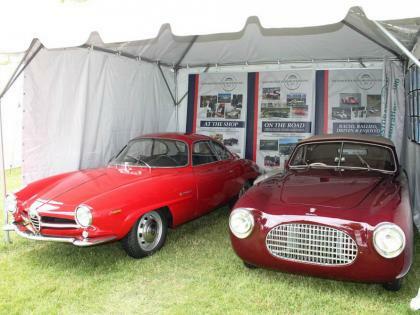 As in years past, we at Automotive Restorations Inc., were both proud and pleased to have been a part of the Greenwich Concours d’Elegance in both its Concours Americana and Concours International formats. It is a cleverly conceived two-day event to make a great “Car Person’s weekend” augmented with a tour on Friday and terrific social gatherings all weekend long. Our people were on the field parking, hosting and doing all we could to help create another great event very much in keeping with the Founder’s intentions and direction. 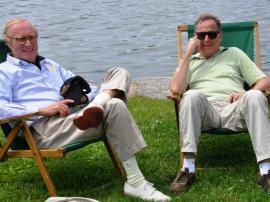 Two pieces of Concours Americana machinery that we know well shared the water views. Left: Brad’s 1966 Cadillac Eldorado Biarritz Convertible awaits judges. 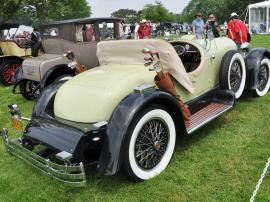 Right: Andy and his 1927 Kissel Speed Bug look ready to take to the links. Andy (R) and Bill (L) “yuck it up” while their two beautiful machines stand guard. 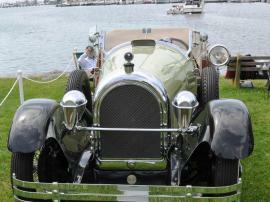 Pictured are Andy’s Kissel and Bill’s superb Delage. It’s about good times, great cars and friends as illustrated here. A good day for all to enjoy! 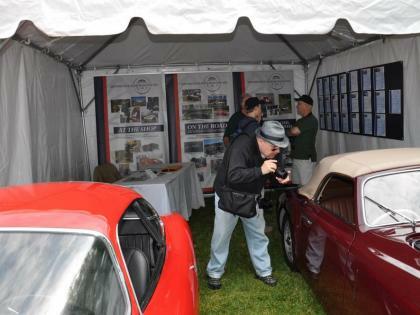 The Automotive Restorations tent gets set up early on Saturday: On exhibit: an example of our craft In the form of a recently completed Cisitalia 202 SC Vignale Spyder and on offer, a super Alfa Romeo Giulia SS 1600. It was a busy weekend but good fun!! Bonhams Auction had 3 great historic rally cars on offer that we happen to know a great deal about!! In the final analysis only the multi-time, class-winning La Carrera Pan Americana 1965 Falcon fell to the Bonhams gavel, but the others sure should have traded. All built in proper competition mode without regard to cost, they are birds of a quality feather. The Shelby GT 350 is a real one that’s 100% fresh and ready. The red 1965 Porsche 911 had already garnered class wins at the Targa Newfoundland event where it finished first OA in the historic class on its debut outing. INTERESTED?? Give us a call and we can certainly help. Now it’s Sunday: it was overcast and comfortable. Lance’s BMW 2002 TURBO is indeed a car of legend. Built to create Autobahn legacy for the 02, these exceptionally capable machines did just that. The turbos were a little cantankerous at low speeds but once spooled up made 200 KPH quickly and really put the 02 on the Autobahn map. We were pleased to see this recently ARI serviced machine on exhibit with Lance and family taking home a Best of the Best award. Peter Kalikow’s 400 Superamerica Cabriolet was not only the event Poster car but the class winner in a Ferrari circle among a field of really exceptional machines We’ve helped Peter on this car over the years and were very pleased to see it garner a well-deserved Best in Class 1961. We seem to be working on a large number of Cisitalias these past few years. They really embody automotive art. 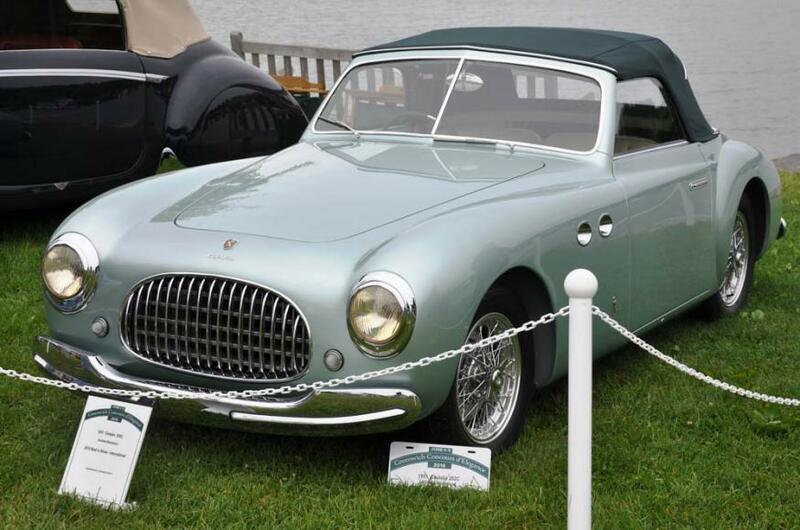 Shown for only its 2nd time we were pleased when it found Sports/GT- Best in Class Presented by The Alden Sherman Classic: 1947 Cisitalia 202 Vignale Spyder of Henry Miller. Event Sponsor Mercedes-Benz was well-represented and it was rewarding to see two ARI clients heading up the line. Hans Middelberg restored his red 1958 300 D Adenauer Cabriolet using his own devices to good effect. 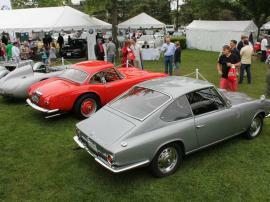 We at ARI restored Bill Jacobs’ Gullwing some years ago. Both found awards at day’s end with Bill’s 300SL awarded as the caption denotes and Hans’ 300D getting the Award for Timeless Elegance, Concours International. 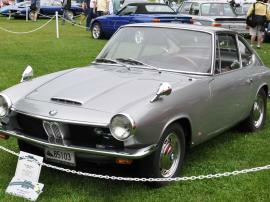 It was well over a decade ago that we saw Axel’s Glas-BMW GT at our shops. Axel is a Glas man of the first order and understands these unique German machines well. He did most of the work. We simply followed his instructions and fixed some body details then applied the paint. We are glad to see it aging nicely and it was a welcome surprise to see the rare and interesting machine on the field garnering the Nutmegger Award. 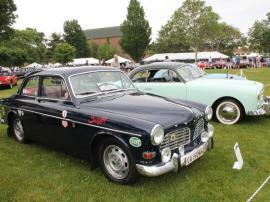 Middle: Also finding favor a Volvo 123 GT we know well and we were glad to see Hans & Samantha Abrahams’ car awarded with Most Outstanding Volvo Presented by Volvo Cars USA , 1967 Volvo 123GT Two-Door Coupe. Another machine we tend often: Ann and Bill Scheffler’s well-enjoyed Jag found Most Outstanding Jaguar Presented by Jaguar Land Rover Darien. Sunday's weather was on-again, off-again with some pretty heavy afternoon showers. The ARI crew helped the Wennerstroms orchestrate a rearranged schedule that had the winners’ awarded and the whole story told by 3PM. Off went a super field of fine machines. We are sure all the cars enjoyed the weekend, quite a few got a good wash and exhibitors shared good times and tales aplenty. A huge thank you and well-done to this first of the new Greenwich Concours under the direction of Mary, April, Bria, Leif, Kirk and Nord Wennerstrom. It is indeed a family affair!